Quetzalcoatl’s Final Prophecy. Legacy of White Solar Wind. Where Will You Be On The Day Of The Shaking Earth? The May 1st date at the top of the Sunstone, 13 Acatl is also the date of its dedication, AD 1479 The exaltation of the 13th power of the 13th sign, Acatl [Skywalker] is a prophecy of the 13 Moon Calendar by whose reckoning the Nahui Ollin date was decoded. Verification of the Aztec Sun Stone: 13 Acatl = 13 Skywalker at the apex of the Sun Stone; Nahui (4) Ollin = 4 Earth, the all-embracing center of the Sun Stone. On the Dreamspell 13 Moon Calendar, Kin 13, 13 Skywalker occurs on the 28th day of the Planetary Moon; Kin 17, 4 Earth occurs four days later on the fourth day of the Spectral Moon. On the Gregorian Calendar these dates are May 1 – May 5, 2000, the Week of Destiny, the Day of the Shaking Earth. The 911 Emergency World Peace Meditation is based upon the Law of Time and should fulfill the requirements of Postulate 9.11. The day 13 Skywalker is the seventh and last day of the Seven Day Earth Wizards Intensive on the Law of Time. Nahui Ollin: Quetzalcoatl’s Final Prophecy – A testament of the Sun Stone affirmed by the tradition of the Chilam Balam (Mayan-Galactic Terma decoded by the Closer of the Cycle VV). Nahui Ollin: Sun Stone 4 Earth – 13 Skywalker, 13-Moon-28-Day Terma of Quetzalcoatl to further the birth of the coming of the true religion of the One God Hunab Ku, One Giver of Movement and Measure, the power of the coming Solar Age, the Sixth Sun of Consciousness. Biosolartelepathic Event Horizon: 10.28 – 11.4, cosmic-self-existing principle-of-time chromatic, Kin 13 – Kin 17, Week of Destiny, Day of Destiny, Day of the Shaking Earth, Nahui Ollin. Where will you be? What will you know when the Fifth Sun ends and the Sixth Sun begins? Nahui Ollin: Corpus Profeticum Quetzalcoatl, Legacy of White Solar Wind. Annihilation and resurrection are potencies of the center of the Earth. The Fifth Sun dies and the Sixth Sun is born – through the center of the Earth. All prophecies, prophets, and messengers of ancient Mesoamerica form a common interlinked whole. This whole comprises the Corpus Profeticum of ancient Mesoamerica. The principle prophet and unifier of this prophetic network is Quetzalcoatl. For this reason, the entire structure of prophecy and revelation of ancient Mesoamerica is referred to as the Corpus Profeticum Quetzalcoatl. It is Quetzalcoatl who links the tomb of Pacal Votan to the Aztec Sun Stone. It is Quetzalcoatl who unifies the Annals of the Cakchiquels with the visionary architecture of Teotihuacan, Xochi Calco, Chichen Itza, and behind it all, Tula – historic Tula, mystic and mythic Tollan. It is Quetzalcoatl who opens the key to the prophetic tradition of Chilam Balam and who rearises on countless tenement walls as the Plumed Serpent Vision of the Coming Sixth Age of Consciousness. If Pacal Votan is Abraham, Quetzalcoatl is Moses, Jesus and Muhammad all in one. The personality of Ce Acatl Topiltzin Quetzalcoatl is the catalytic node that emanates meaning to all the other aspects of the prophetic mind stream of Mesoamerican civilization. While Pacal Votan was associated with Venus as the evening star, Quetzalcoatl was associated with Venus as the morning star. Nahui Ollin, the Fifth Sun, encloses the four previous suns: Nahui Ocelotl, Nahui Ehecatl, Nahui Quiahuitl, and Nahui Atl. Each of the Suns is destroyed on the day from which the name of the Sun is derived, e.g. Nahui Ocelotl = 4 Wizard, end of the First Sun; Nahui Ehecatl = 4 Wind, end of the Second Sun; Nahui Quiahuitl = 4 Storm, end of the Third Sun; and Nahui Atl = 4 Moon, end of the Fourth Sun. Thus the Fifth Sun, Nahui Ollin will be destroyed on the day 4 Earth, Kin 17. This day will occur Spectral Moon 4, Seventh Year of Prophecy, when all of the planets on lined up opposed to the Earth on the other side of the Sun. The day Nahui Ollin, 4 Earth, will be known and registered on the Thirteen Moon 28 Day Calendar that marks the end of the Fifth Sun and inaugurates the beginning of the Sixth Sun, the Sun of Quetzalcoatl. Kin 17: Red Self-Existing Earth, “Nahui Ollin;” Kali 4, Fourth Solar Witness, Red Lunar Earth; Psi Chrono Unit, Kin 113: Red Solar Skywalker; Wizard Wavespell 2; Harmonic 5: Resonant Matrix; bi-phasic Codon 28: Time of Bursting; Weekly Codon 61, Inner Space Line 4, Week 41; Seventh Year of Prophecy, Victory Discharges. How will you fare on the Day of the Shaking Earth? What will remain for you to possess when the Sixth Sun of galactic consciousness dawns? 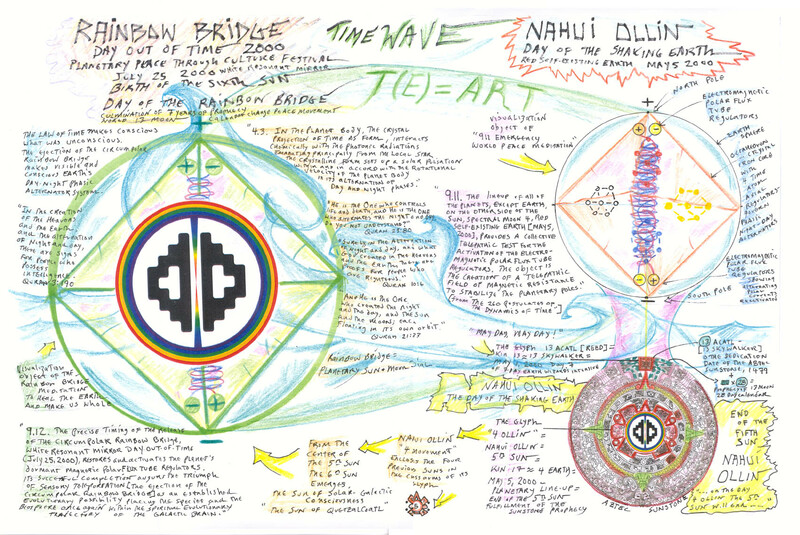 Note: See graphic “Nahui Ollin Rainbow Bridge Time Wave” for Nahui Ollin meditation and visualization. Nahui Ollin Rainbow Bridge Time Wave. Drawing by José Argüelles. Click to Enlarge. Form a circle with your gathering and with eyes closed visualize the Earth in the center of your group or, if alone, in front of you. Within the swirling ocean and clouds of the whole Earth visualize in the center the octahedron crystal core. This core is aligned at top and bottom to the North and South Pole of the Earth. Its upper half has two red and two white sides. Its lower half has two yellow and two blue sides. All the sides are transparent. Holding together the polar axis are two Time Atoms (as depicted above). The upper red Time Atom is turning a clockwise direction. The lower blue Time Atom is turning a counterclockwise direction. In this way the two Time Atoms stabilize the polar axis of the Earth as it runs through the crystal octahedral core. To the left is a white Time Atom and to the right is a yellow Time Atom. These two Time Atoms remain on the horizontal gravitational plane and can be visualized turning on the whole plane from left to right. In this way the gravitational field of the Earth is stabilized within the crystal octahedral core. On either side of the North Pole and the South Pole are positive and negative charges oppositely arranged. Visualize a red coil extending around the polar axis connecting the positive charges of the two poles. Visualize a blue coil extending around the polar axis connecting the negative charges at the two poles. These red and blue coils may be imagined like a luminous double helix around the Polar axis. At the center of the core, where the polar axis intersects the gravitational plane there is an intense white light of unconditional love. This white light connects with your own heart center. Then extending north and south on the polar axis this white light streams to the north and south pole of the Earth. From the two poles this white light transforms into two streams of rainbow light creating a double-rainbow bridge around the Earth. Hold this meditation until you feel you have all the parts in order and the energy is streaming into the Rainbow Bridge. When you are through you may take the entire visualization and place it in your heart center. As you go through the day remember that the entire octahedral image with the Rainbow Bridge remains in your heart center. If you wish you may also holographically imagine that you are in the center of the octahedral core and as you go through the day flash this image also. This meditation of the crystal octahedral core of the Earth should be maintained on a daily basis until the time of the Rainbow Bridge event, Day-Out-of-Time, July 25, 2000. In this way we generate a time wave that extends from the Nahui Ollin to the Rainbow Bridge. By doing this exercise we are demonstrating how the synchronic order encompasses a natural interplanetary cosmic mind event and transforms it into a time wave that will reach its culmination with the actual ejection of the circumpolar Rainbow Bridge.